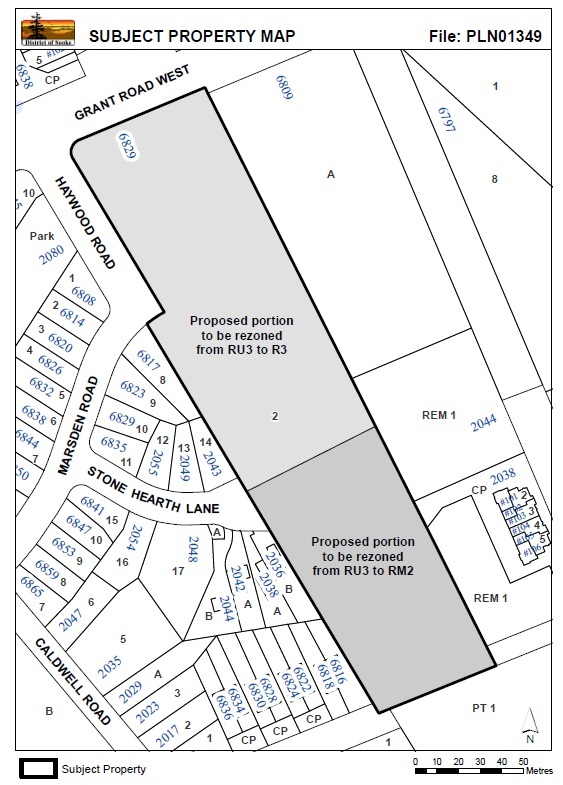 Council set the wheels in motion to rezone two lot at and near 6829 Grant Road, at the Haywood intersection. The applicant is proposing zoning changes that would allow for 50 units to go on to two lots (see the full map below, extracted from the report), broken down to 34 multifamily units and 16 single family units. The proposal is consistent with neighbouring density. For the affordability component, the applicant is offering $500 per unit cash-in-lieu, totaling $25,000. They are also proposing that 11.5% of the total land will be dedicated to park. Road dedications are also proposed. According to the staff presentation, the application is supported by existing policies and bylaws. Mayor Maja Tait asked about the large tree on the lot. Its fate was unknown. 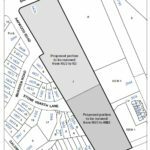 The fire hearth at the end of Stone Hearth Lane would remain unaffected, as it is beyond the parameters of the two lots seeking rezoning. Councillor Kevin Pearson supported this development, and he moved first and second reading which was seconded by Councillor Kerrie Reay. Reay was pleased to see this come forward, stating that it was essential to Sooke’s road network and that it would push Eustace through. Parkinson brought up parking, indicating that she would be looking for sufficient parking for the new residents, with additional parking spots. The owner will also be required to enter into section 219 covenants registered in priority of all other charges on title for parks and trail dedication and construction, road dedications and Affordable Housing Reserve Fund contributions. The first and second readings were passed unanimously, and a public hearing will be scheduled before a third reading can be made. Present: Mayor Maja Tait and Councillors Ebony Logins, Kevin Pearson, Brenda Parkinson, Bev Berger, Kerrie Reay, Rick Kasper.